Preschool science should be fun, informal, and full of opportunities for discovery. The best activities are short and allow students to investigate relationships through observation and play. While there are a lot of great activities, keep in mind too that your garden, kitchen, or even common toys can become vehicles for scientific inquiry. Teach your kids how to observe the world in detail. Keep your observations in a notebook or scrapbook and make sure to include pictures, drawings and other visual descritions of what you observe. This easy experiment takes about 10 minutes or less. You will need a small glass jar (baby food jars are perfect), a damp paper towel and a dry kidney bean. Dampen the paper towel and wrap it around inside the glass jar. (You may need to cut the paper towel). Insert a bean in between the jar and the damp paper towel. Take some time each day to observe how the bean is growing and talk about the bean's life cycle. Be forewarned that beans take about a week or so to grow. Consequently, you may want to consider introducing the bean as it's about to sprout. Butterflies are some of the most amazing creatures in our world. Preschoolers will be interested in how they change from a caterpillar, weave a cocoon, turn to goo and emerge as a beautiful butterfly. 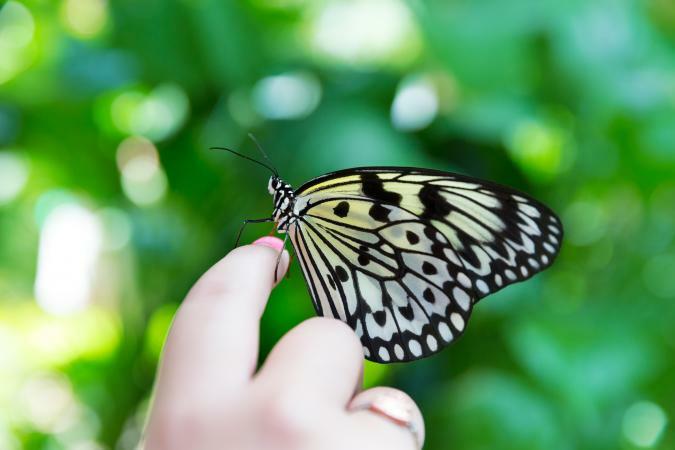 Observing the butterfly opens many opportunities for discussion. Insect Lore is a great place to find kits to buy. Each kit will walk you through the entire process of growing your very own butterfly. Place a hula hoop on a spot of grass in your backyard and have your preschooler get down on his stomach and observe what is going on inside that hula hoop. What types of plants grow inside the hoop? What might be going on under the ground (moles or worms)? How do all these plants and animals relate to one another? Ask the child how things might change if it started to rain very hard. This will get the child thinking about the world around him. Believe it or not, the germs on your little one's hands are easy to spot if you use some Glo Germ hand gel. The hand gel glows in the presence of germs. Talk about how germs are spread with your little one, have him wash and dry his hands, and then use the hand gel to find the germs. It's an interesting activity focusing on something not many preschoolers get to see. Take the lesson a step further by reading Sherm the Germ. Making slime is a great early introduction to chemistry. While you're making it, talk about how it feels, what happens if you hold it versus what happens if you continuously move it around in your hands. This is a great sensory project as well. Take an old muffin tin (mini muffin pans work well) and add just a drop of food coloring to each tin. For excitement, add a different color to each pot. Cover the color with baking soda - enough of a layer so that your child cannot see the colors. Use a measuring cup or even a pitcher to pour vinegar in each tin. Not only with the baking soda and vinegar react, but each tin will be a different color. When you're done, you can let the cakes dry and use them as watercolors, or add more food coloring to discover how colors are made. For example, add yellow to a cup that has blue in it to get green. It's never too early to start teaching about density! To prepare, choose four different liquids such as water, oil, vinegar and milk. Add food coloring to each (this just makes it easier to see and is optional). Then have your little one pour each liquid into a clear cup and watch to see what happens. Ask him what he thinks is happening and explain how some things are 'heavier' or 'more dense' than others. The liquids at the top are less dense, and the ones at the bottom are more dense. 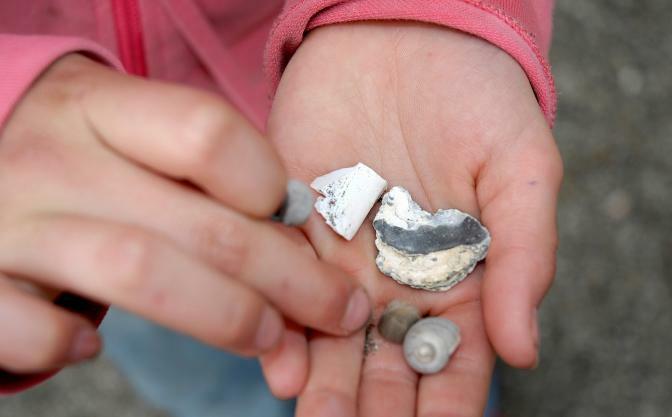 Encourage your little one to collect rocks. When you get home, sort them into like types. Introduce her to the types of rocks, but encourage her to find ways to classify based on color, size, shape. The great thing about this activity is that you can reorganize your collection any time you want for a new sorting activity. There are so many things your little one can learn from building a block tower. Use any kind of blocks that you have, and encourage her to build a tower as high as possible, until it falls over. Once it falls over, ask her if she has any ideas on how to make it more stable so she can build it higher. One idea to try is to make the base of the tower a little wider. However, there are a few possible answers to this one. Make three-dimensional shapes come to life by encouraging your child to build a pyramid, block or even a dome with his snack! You might have to make one to demonstrate. The best part is, after it's all done, you can eat your project. Go out and get a large package of Red Solo Cups or similarly sturdy plastic cups. Challenge your child to build a big pyramid. Then encourage him to knock it down. For an extended activity, rebuild the pyramid several times and then knock it down starting in different places. Make note with your child what happens to the whole structure based on where you start knocking it down. To prepare for this activity, use a clear plastic cup and freeze some water. You may consider freezing several cups of water. When the water is fully frozen, have your child observe what happens when you pour salt over the ice. Try pouring it just on one side or right in the middle. Make sure to ask what happens. Consider using a thermometer to test the temperature of the ice water after you've added salt. You can follow up this activity by making homemade ice cream. Sometimes, simply playing is the best way to encourage scientific inquiry. If you have a birthday or holiday coming up, look to pick up some meaningful toys that will encourage that kind of thinking while he plays. 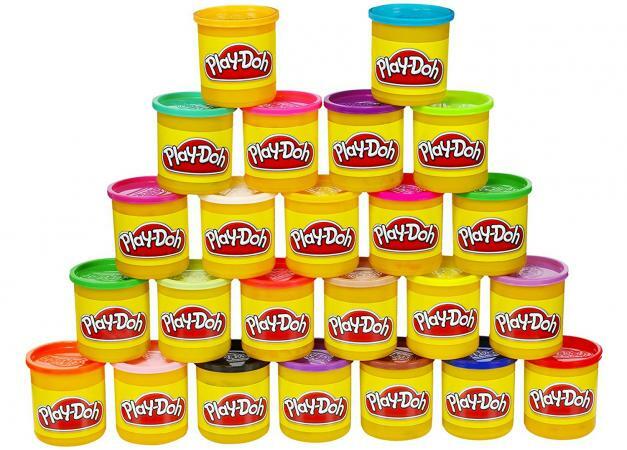 Play dough is an ideal toy for preschoolers with endless possibilities. While many people tend to think of it as an artsy toy, it has a lot of STEM applications too. Try encouraging your child to build a tower, make bricks and make a building, or use play dough and toothpicks to make three-dimensional shapes. Kapla Blocks are building blocks that are skinny and come in various shapes and sizes. Unlike other block systems, Kapla Blocks come in giant containers, making it possible to build just about anything without running out of blocks! Try challenging your little one to a bridge building contest or even to building the best house ever. As she builds, ask her about her structure and what the different parts are for. A catch and release bug vacuum is a great tool to learn more about what lives in your backyard. 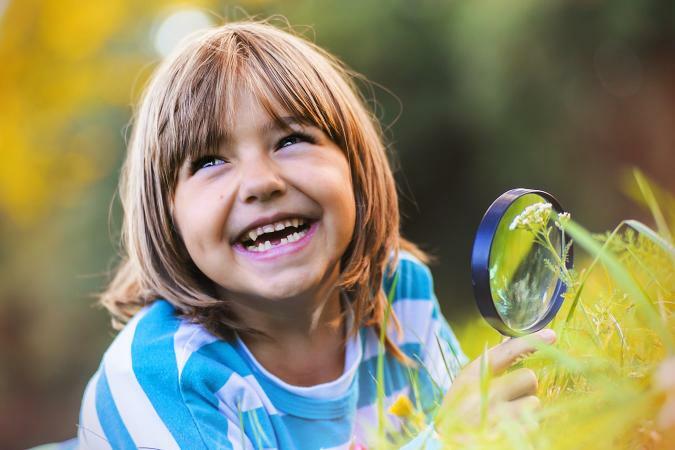 Catch a bug, and encourage your child to observe it through a magnifying lense. The best part is, you can release the bug back outside, keeping the critters outside your front door. While you might not be ready to invest in a full set of Legos, Duplos are larger, easier to put together and still encourage those thinking skills. Build on a blanket for easy clean up. Learn more about properties of water around a water table. 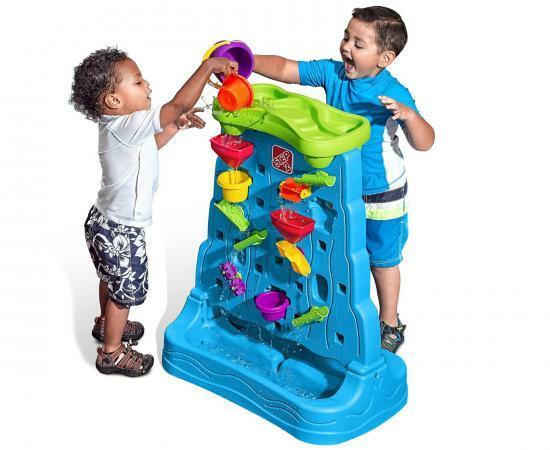 Kids can use this simple toy to discover the power of water, how water changes shape to fit its container and even discover how things float or sink. There's not many things more fun than getting wet! Take this simple tool and turn it into a STEM investigation. The sand can mold into any shape so your little one can build castles or houses. Take the opportunity to challenge him to build a house, tower or even a tunnel. Make backyard observation time more interesting with a pair of binoculars. Ask children to describe what they see, and encourage them to look in the trees for nests or small birds. Discover the properties of magnetics with a wand. These are great tools because they cannot be swallowed and typically are strong. Use them to help your child decide what is and is not magnetic. From there, he can start to classify things that are or are not magnetic. For example, you might ask him to describe what all the magnetic things look like, leading him to note that all the magnetic things are metal. The key to teaching science concepts to your preschooler is to encourage detailed observation. For each activity that you do, ask basic questions like what's happening and why it's happening. Use pictures and a notebook to record observations; you can even use video. Make it hands on and set up experiments in such a way so that your preschooler can participate rather than just watch and you'll grow a kiddo who loves exploring science.